Having just completed a visit to Driftwood Brewery in Victoria, I was standing outside their front door contemplating where to go next when I happened to glance across the parking lot into an open delivery door. Surely those couldn’t be fermenters. I mean, how could you have two breweries looking at each other across the same parking lot? View from the delivery door. I ambled over, took a peek inside and sure enough, it was a very small but clean and efficient looking brewery. 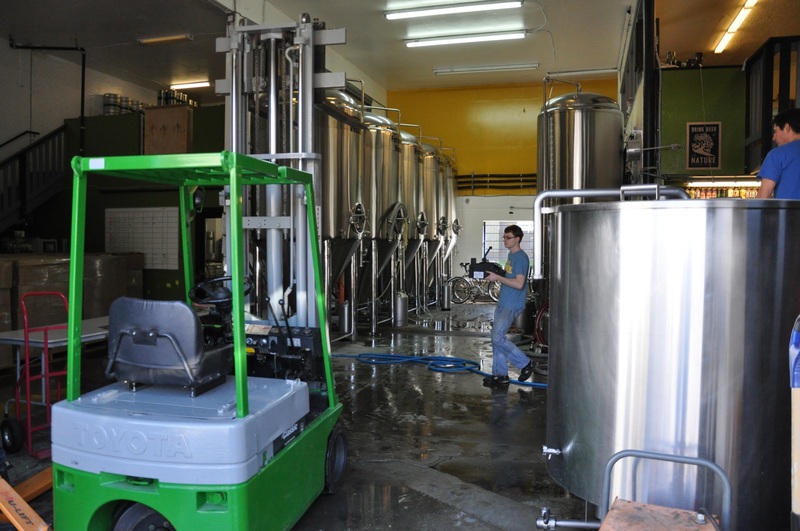 Three or four employees were busy at various tasks around what looked to be ten fermenters. A polite inquiry gave me the word that I was looking at Hoyne Brewing, and a few minutes later, Sean Hoyne came out to chat. I actually knew Sean’s name before I met him — when I had been working on a college project a few months ago, I had sent an email to various brewers asking for some advice on the added cost of ingredients in remote places like Vancouver Island; Sean was one of the brewers who had taken the time to reply. Sean has been a major force in Victoria brewing for many years. In 1989, in the early years of the craft beer movement, he helped open the brewery at Swan’s Hotel, eventually becoming the brewmaster there. In 1998, he set up the Canoe brewpub and was brewmaster for 13 years. At both of those locations he not only raised the bar for craft beer quality and diversity, but he also trained a new generation of brewers, many of whom have gone on to great things. Two years ago, Sean left Canoe to open his very own brewery. He found what he thought was the perfect location for a 10-hL brewhouse — right across the parking lot from Driftwood Brewery. I’m sure you can imagine the conversation if Labatt came to Molson and asked to set up a brewery right next door. However, this is the world of craft beer, where there is not only an air of collaboration, but also the recognition that having more breweries and more products actually strengthens everyone by creating more consumer awareness. So Driftwood gave Sean the thumbs up. A 10-hL brewhouse is not very large — only twice the capacity of our small brewery at Niagara College — but that was probably a good thing, because when he started, he was the only employee. Today, less than two years later, it looks like he has lots of help. Their website lists several regular offerings, including two types of pale ale, IPA, pilsner, red lager, espresso stout and bock, and one limited release, a strong (9% abv) winter warmer; alas, Hoyne Brewing has flown under my personal radar, and I have not tasted any of Sean’s beers yet. I will be sure to correct this deficiency on my next visit to B.C.